Making comics can be a hard gig. It is for anyone, and it doesn’t matter if you’re jumping into a story about space pirates or small-town life. But with some subjects, there lies a responsibility in not just telling a good story, but getting things right. That can prove to be treacherous territory unless you handle it with care and consideration. 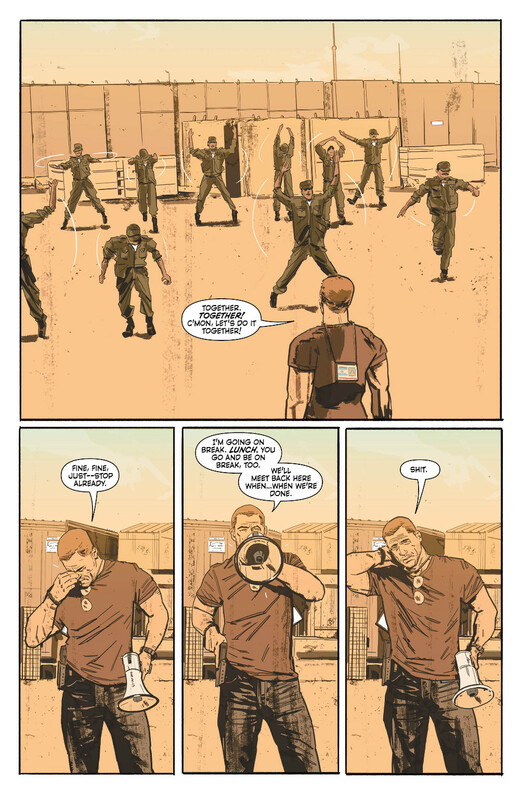 That’s one of the reasons why Tom King and Mitch Gerads’ The Sheriff of Babylon is one of the most interesting titles of the new wave of Vertigo books for me. For outsiders like myself, the Iraq that the story takes place in is a world as unreal as anything I can find at Marvel or DC proper, as it’s something I’ve never experienced before. But because of the creative team’s background and passion, it’s grounded in reality. For one, King worked at the CIA on the ground in Iraq during the era, meaning this is a story that comes straight from the Iraq he knows first hand. And for Gerads, this world is greatly of interest to him, and has been well before I got to know his work on The Activity at Image. Today, I talked with Gerads about this book, why it’s so important to the both of them, how necessary it is to get the details right, what working with Tom is like, and much more, while sharing several pages from tomorrow’s first issue. It’s a very insightful conversation into how Gerads works, and why this is something he had to be involved with. And speaking of the book, it’s phenomenal and arrives tomorrow in comic shops. It’s a haunting look at a very real and very misunderstood part of the world, and one that approaches the subject with the nuance needed to not just engage with the world, but perhaps understand it a bit more. A big part of that is Gerads’ work, and if you’re on the fence as to whether or not you should read it, consider this my endorsement. Alright Mitch, take us back to the beginning. How did you first figure out you wanted to be a comic artist, and what did you do to help develop and hone your skills over the years? Was there any art schooling in your background? MG: I have two older brothers, 13 and 14 years older, and they were my heroes growing up. People are always surprised that we get along so well with the age difference, but we’re all super close and I still look up to them. They were both voracious comic readers. So I distinctly remember the moment I knew I wanted to be a comic artist. : I was probably 4-5 years old and I snuck into my brother Greg’s room when he was at school or some junk, and started flipping through issues of NEXUS he had lying around. I couldn’t read them yet but I knew I wanted to be Horatio Hellpop. When it dawned on me that I couldn’t actually be Horatio Hellpop, I knew I wanted to tell his stories. The light bulb went off above my head and it’s never turned off. …’til my senior year of high school. I’ve always had a level head on my shoulders and I knew how insanely tough it was to make it in the comic business. So I decided to bench the specifics of the dream and pursue Graphic Design as a major in college. Out of college I luckily found a great GD job that really allowed me to flex my illustrative muscles as well. Illustrating kids packaging for General Miils, Nabisco, and others. Five years later I was let go due to massive company downsizing and that was actually the push I needed to pursue my lifelong dream of comics! You’ve done some prominent work in your career, and much of it is built around the more militaristic side of the world, like in The Activity and now The Sheriff of Babylon. For you as an artist and storyteller, what makes that part of the world such an interesting and fertile ground to work in? MG: There are so many factors at play here. I’m the only male in my family not to have been in the armed forces in some capacity. I’ve always been fascinated, interested, and in awe of the military, especially the special operations side of things. The silent, smart, and methodical guys. It’s the real world Batman story. Guys who have trained so purposefully and so hard that every move they make is deliberate and without hesitation. I’ve made a career out of trying to bring authenticity and respect to the military in comics. Just like Superman and Captain America, I’m just telling stories about heroes. For The Sheriff of Babylon, it feels that both you and Tom are very invested in the subject matter. It’s something of great interest to you both. What about this project gets your creative juices flowing, and beyond that, would you call this a personal project overall? MG: Tom [King] has the easy answer to this. He lived it! Well, he lived the location, time, the sand, etc. For anyone that doesn’t know Tom’s background, Tom was a CIA Operations Officer who was actually in Baghdad at the time SHERIFF takes place. So this book is a tale right out of Tom’s Iraq. It’s also Tom’s first time directly talking about the war he saw. Because of this it’s become a VERY personal project for me as well. It’s personal in that I feel I owe it to Tom, the military who was there, the Iraqis who lived there, and I feel I even owe it to the land. Add Tom’s incredible story and scripts to the mix and this is my passion project. This is my Eisner bid. I’m putting everything I have into this book because everyone else involved is as well. I know it’s a comic book, but this project really feels “important.” I want everyone to read this book, not because I want sweet sweet royalty checks, but because I think it’s an important story that people should read and one that I’m immensely proud of. It’s your first project with Tom. How has the process of developing the book been, and beyond that, can you walk us through how you bring an issue of The Sheriff of Babylon to life, beginning to end? MG: Easy (laughs). Tom and I clicked from the first time we talked. I get exactly what Tom is shooting for. To a weird degree. Almost like he’s writing from my own head. I have this bag of tricks that I love to tell stories with, but I don’t get to use them that often and if I do it’s because I’ve adjusted the script to use them. With Tom he writes my tricks right into the script so I see the vision (not a plug) immediately. Side note: Tom writes incredibly interesting and unique scripts. They’re really fun to read! 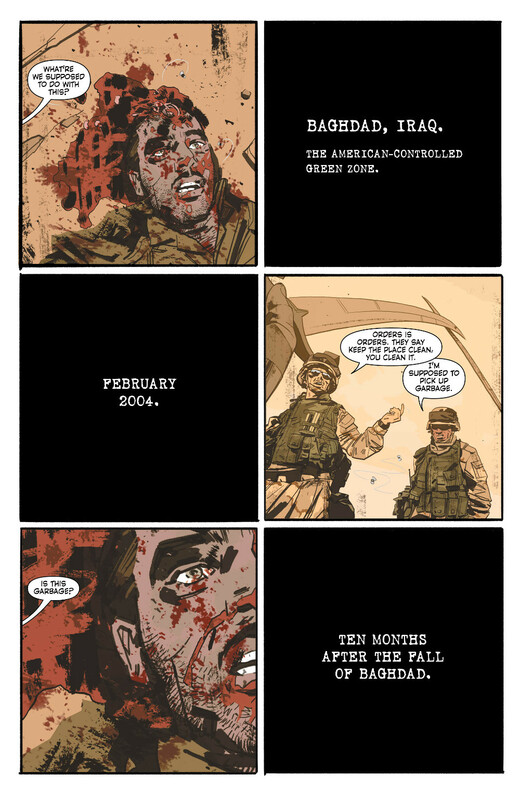 The alternating black boxes with text overlaid are a motif that appears several times in the first issue. What was it about that method of delivering the story that stood out to you so well? MG: It’s one of those super-interesting Tom tricks. It’s so powerful in this issue. More powerful than depicting the action ever could be. This book doesn’t set out to glorify action of violence. It does set out to hit you in the gut with how real it is. I approach all the violence in this book from a very real place. I’m not trying to gross anyone out, but violence is horrible and I want readers to see that and to be taken aback by it when it happens. Also, the alternating black boxes don’t continue to the next issues. Each issue kind of has it’s own unique hook. Like I said, Tom scripts are super interesting and fun to read! Dealing with a real location in a very real time of conflict is always going to be a potentially sensitive thing. For you as an artist, how important to you was it to do your research and make sure everything was as authentic as you could make it? Beyond that, would you say you like to research your projects overall? MG: I’m obsessive about research. Whether it be from all the reasons listed above or just my own artistic tic. Baghdad is a real place. Sheriff might not be a true story, but it’s fiction surrounded by truth. It seems disrespectful to just make things up. That being said, it’s CRAZY difficult to find reference from that time period, which was only like 11 years ago! Luckily, I have become very adept at research. I go deep. I follow the rabbit hole for much longer than is even necessary (laughs). For example, there’s a phone in Nassir’s house in issue 1. I spent a good 30-45 minutes researching common phones found in Iraqi homes. Like they use anything different than what we have (laughs). Like I said, obsessive. Every location, every street, every building, every phone in Sheriff: that’s a real place/thing in Baghdad circa 2003. One thing about this book that stood out is it has a very cinematic feel, even down to the credit box. This page is a great establishing shot of the turmoil going on in Baghdad. When you and Tom were first developing the project, was that cinematic feel something you wanted to go for? MG: Thanks! Yeah that’s just how I personally see comics. My biggest storytelling influence is Bryan Hitch, the MASTER of cinematic comic storytelling. I left comics for a couple years in college and The ULTIMATES is single-handedly responsible for bringing me back. Blown away would be an understatement. I was in awe of how he chose to tell the story. That’s always stuck with me as I pursued my career. I just naturally see things that way. My favorite storytelling tool is transition. Sometimes panel-to-panel doesn’t cut it. I want to show how people move in that moment so I’ll extend the use of backgrounds to show that movement. I just really don’t think “the camera” needs to move every single shot in comics. It’s all about conveying the atmosphere of the scene. I want people to feel that moment and recognize it in themselves. 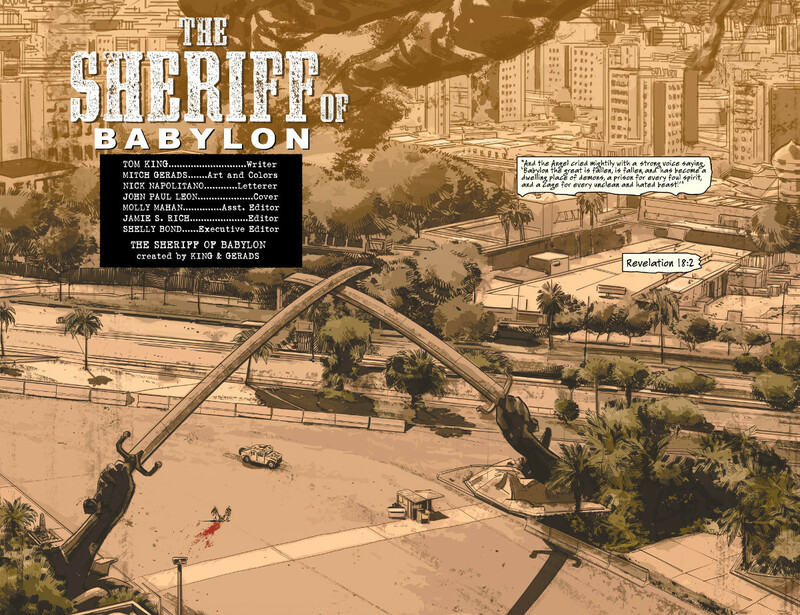 Baghdad is probably the main character of Sheriff so that opening double-page-spread is to show off just how big and menacing this wild wild West (Middle East?) is. 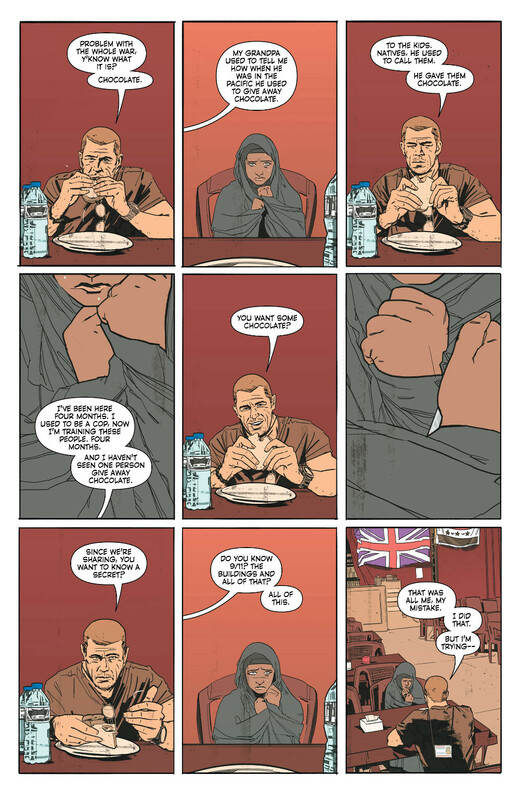 This is a really fantastic introduction to Chris, the titular Sheriff of Babylon. I love his mix of disgust and discouragement with his trainees in the three panels at the bottom. When it comes to character acting, what’s your approach? It seems like you want to convey a natural feel, but you don’t want to overact by any means. It can be a fine line, and one you walk well here. MG: Thanks! There’s a great famous YouTube video this scene is based on. My favorite moments in real life or entertainment are the subtle ones. It’s where all the real human emotion lies. I try to keep that alive in my “acting.” I shoot my own character photo ref so I’m able to control that level of emoting. Half of the magic is all in the script. Tom writes incredibly human humans. Everyone in his scripts acts and talks like real people do. He’s good. He also pays me $5 every time I tell people how good he is. I like the usage of the three panels at the bottom if only for the quiet passage of time they convey. When you’re laying out an issue, what are you looking for in your layouts? Is your primary focus on keeping the storytelling clean? MG: Absolutely. I’m here to tell a story. If I’m not doing that clearly then I’m not good at my job and I want to be good at my job. I’m also a big fan of theme and transition (As mentioned earlier) so the grid is my best friend. We all know Tom’s obsession with the grid so now you’re getting a glimpse into just how well we work together (laughs). I really love this nine-panel grid page and how you alternate between the casual and confident Chris and the young, horrified girl with the bomb. Given the situation, it’d make sense that those roles would be reversed given who is in control there, but it says a lot about the situation that it isn’t. How essential to getting this story right is it to not just position each side of the equation as one thing, but as a nuanced situation with complicated motivations? MG: There’s a lot being told on this page. Aside from the situation itself we’re getting our first real look into Chris’s character. It’s also got some clues in it as to what motivates Chris. This page also features one of my favorite little nuances in the book. Chris constantly wearing his ID badge backwards. It’s just one of Chris’s foibles that I love to throw in there. At the end of the day I want people to feel that all these characters could be real people. I’m four issues in at the moment and they all feel real to me. I care about all of them. You color your own work, and the reds and oranges on this page stand out as the backgrounds on the page. It speaks to the intensity of the situation. How do you like to use color in your work? Is your primary focus on the mood of the situation? MG: Coloring is my absolute favorite part of the process. I view it as the step where I get to make everything real. I get to add atmosphere. I get to make people live in the space of that panel. A few conventions ago I got to talking with a former Marine (Never call them an ex-Marine. Just don’t do it.) and he got to talking about his unfortunate battle with PTSD. He talked about how much he appreciated the color coding that I’ve done in both The ACTIVITY and The PUNISHER because that’s how he remembers things from his tours. He remembers the color of the memory. The first time he was shot at all he remembers is everything being blue. His first time walking the city he remembers everything in oranges. This fascinated me. So with Sheriff I have set out to do convey that to the reader. Every scene has it’s own overall color coding. Even the characters have colors associated with them and when they interact those colors can combine or create something new. I’ll never forget that conversation. It’s one of those moments that hits you like a ton of bricks in the best way. I can’t resist asking about your cover artist. 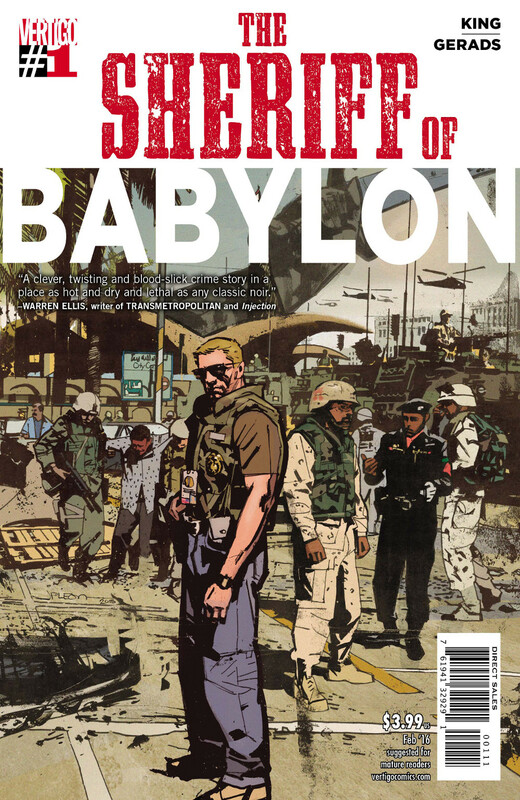 How rad is it to have the great John Paul Leon providing covers for The Sheriff of Babylon?